Dear Readers, one is not supposed to have favourites, either in offspring or pets or, indeed, in the plants that one writes about. Nonetheless, as you’ve probably gathered, I have a great fondness for members of the Borage family. However, in second place would be the dead-nettles, because this common plant repays close attention: the flowers of red dead-nettle and white dead-nettle are exquisite, as are those of the woundworts and claries and the lovely bugle, which I described a few weeks ago. 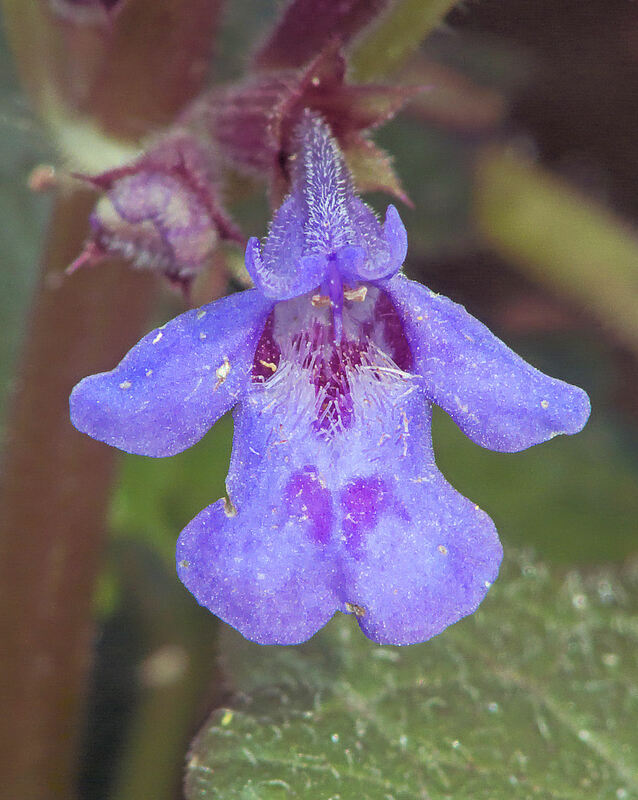 So I hope you will forgive a further foray into the Lamiaceae, because here is ground ivy, a common plant with the most delightful little homunculus-like flowers. Ground ivy used to be known as ‘the blue runner’ because of the way that it spreads by horizontal runners known as ‘stolons’. It is sometimes considered a veritable pest, and has been carried to many parts of the world because of its medicinal and edible uses (of which more later). 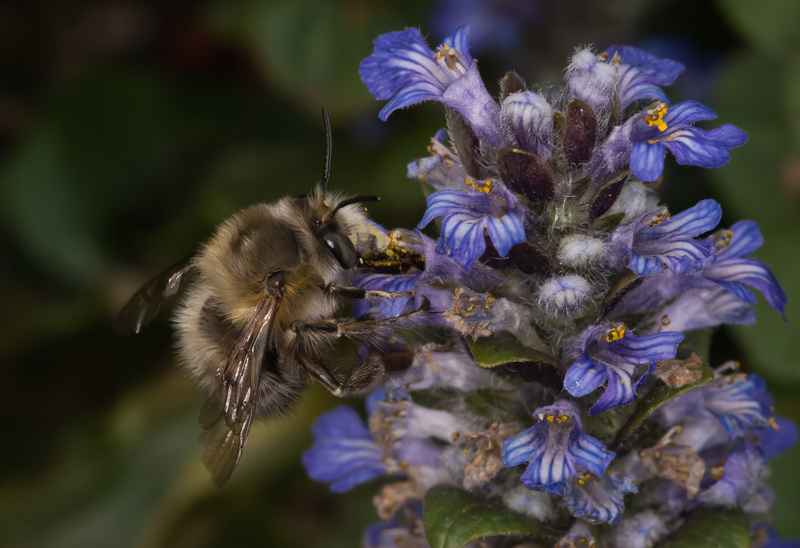 But, like so many in the family, it is much favoured by wild bees, especially the smaller solitary bees that appear early in the year, such as the hairy-footed flower bee (pictured below feeding on ground ivy’s close relative, bugle). Ground ivy is not, as we know, an ivy – the name probably refers to the shape of the leaves. Some of its other names, such as alehoof and alegill (guiller is a French word meaning ‘to ferment ale), hint at one reason for the plant’s wide distribution: it was used to clarify, flavour and extend the keeping qualities of beer. It was used in preference to hops until the 1600’s, and this might explain why it pops up in many cottage gardens in the UK and on the Continent. If anyone would like a recipe for the beer, I refer you to the Barefoot Foods website, although do take note that the author says that the second time he tried to make beer with ground ivy, the carboy exploded. Don’t let that put you off. The plant has also been used as a substitute for rennet in cheese-making. 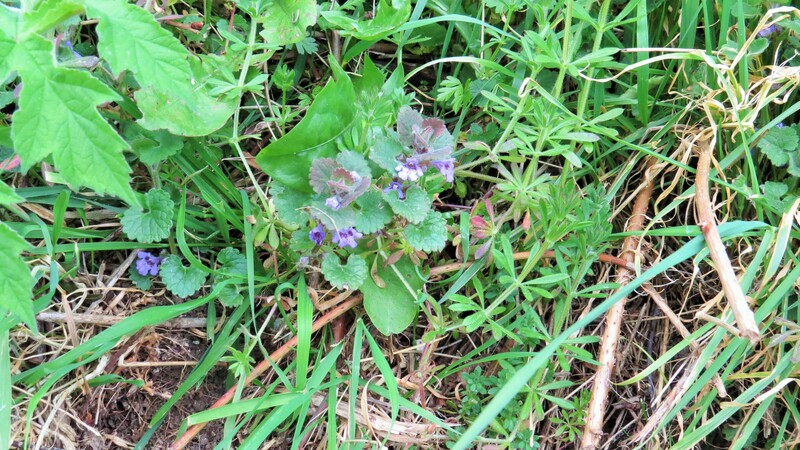 The young leaves of ground ivy have often been used as a pot-herb, or in salads, but for my more adventurous readers, I recommend the Eatweeds website, where you can find a recipe for ground ivy tempura and indeed for lesser celandine and ground ivy stew. For this second recipe, however, you’ll have to get a move on, as the former plant has more or less finished flowering around here. Maybe tofu marinated in ground ivy instead? 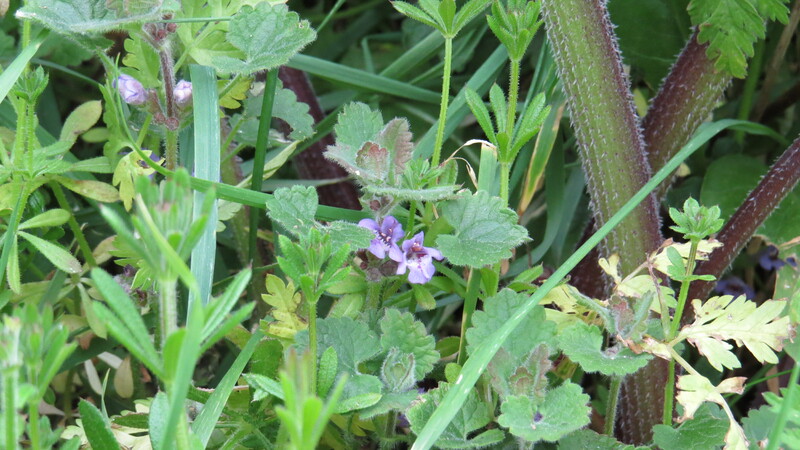 Ground ivy has had a variety of medicinal uses. 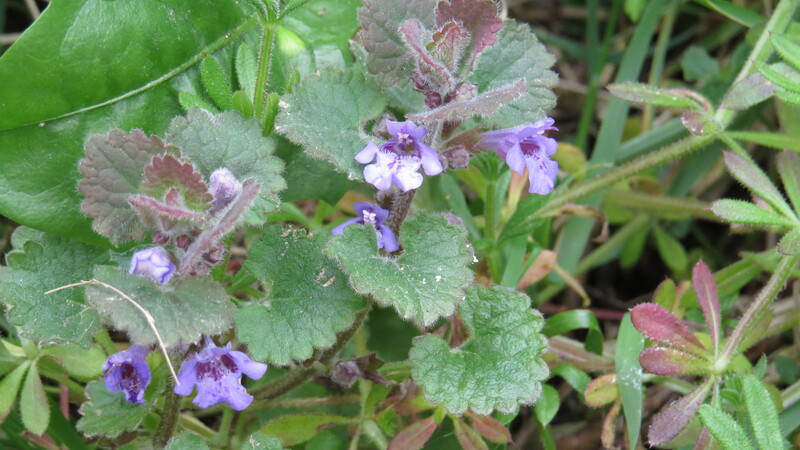 In the ever-wonderful Plant Lives website, Sue Eland describes how, in North America, painters used to drink ground ivy tea as a preventative and a cure for the lead poisoning that they contracted as a result of their trade. The Cherokee used it for colds, measles and rashes on babies. It has been considered a treatment for eye ailments as far back as the physician Galen (c 130 – 200 CE) and has been used for headaches, jaundice, lung infections and asthma. The plant is, however poisonous to animals if eaten in large amounts, and as usual, caution is advised unless you are sure what you are doing. Although ground ivy may be poisonous to cattle, some folklore suggested that it was able to protect cows against sorcery, and in some parts of the world, the first milking was done through a ground ivy wreath, which must have been something of a challenge. It was apparently one of the plants that, if made into the shape of a cross, could be used to identify witches, though I have no idea how. As a middle-aged, somewhat eccentric woman with a cat, I am extremely glad that I live in an age when my strange activities don’t garner more suspicion than the odd tut-tut. With all the many uses of ground ivy, it’s no wonder that it pops up in The Cries of London, which was one of the Poems on the Underground a few years back. I wonder if people bought the ground ivy for salad, or for making a medicine for sore eyes, or for a batch of beer that they were brewing? We shall never know. Of famous London-town!Here`s fine herrings, eight a groat. This entry was posted in London Plants on May 10, 2017 by Bug Woman. I am uncertain as to whether I have ever seen this pretty little plant. What a plethora of uses it has. You always manage to teach me something new, for which I thank you – again. Thank you for reading and commenting, Toffeeapple! 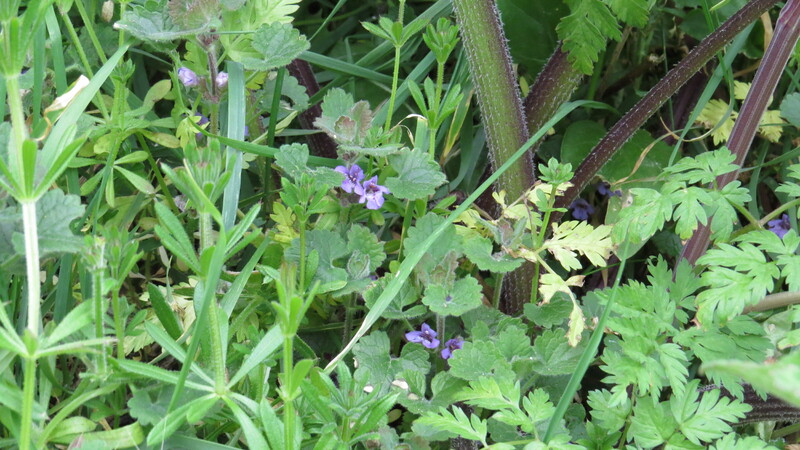 Such is the way of things that you’ll probably see ground ivy everywhere now….